This clever little tool forms clamps from stainless steel wire. 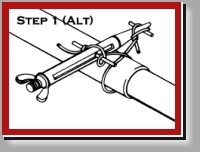 Many people — from bush pilots to sailboat cruisers in remote locations have used this tool many times in emergency situations. Operating in remote areas, away from any kind of support, this is a great tool to have anytime you have to independently take care of things if something goes awry. Fittings on fuel lines, brake lines, air ducts seem to fail at the least opportune time. You can repair radiator hoses, other tools, and ducting with just these simple but strong wire clamps–even when you are far away from the nearest hardware, automotive, or marine parts store. The idea that you can customize the size of the clamp to fit pretty much anything renders it invaluable. With a few feet of wire you may quickly replace hose clamps for quick fixes. 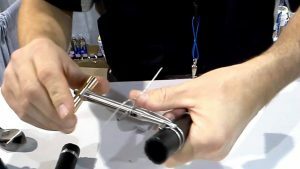 The tool is tiny, compared to most in your toolbox, and the stainless safety wire that it uses to form the clamp is something great to have on hand for mousing and other uses as well. This truly is a wonderful tool. We’ve had a Clamptite tool and wire for more than a decade and have found many great uses for it. 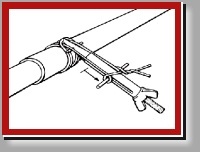 Tighten single or multiple bands of wire around any type or size of material with virtually no flat spots, and then permanently lock the wire in place with full tension. Clamp or band anything – any size, any shape – anywhere. What does this mean for you and me? 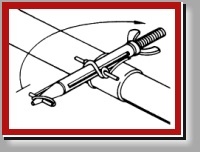 It means you can permanently repair cracked tool handles and torn or cut air or water hoses, create hose clamps of virtually any size or shape, secure the ends of rope, repair cracked or failing structural posts – you get the idea. There are hundreds of potential uses around the house, boat, RV, or in your shop. 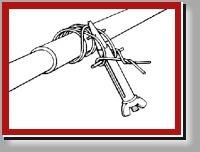 Although stainless steel wire is best, in an emergency any solid wire can be used. The Standard Clamptite with the bronze bar nut can be used with on a full range of wire sizes, but it will be easier to work with the thicker .051 and the .062 wire with the Large Clamptite tool. 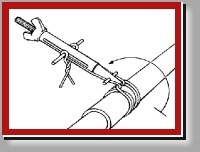 The .032 diameter wire is for small clamps less than 1/2″ in diameter. The .041 wire is good for up to 1-1/2″, the .051 wire is best for objects up to 3″ in diameter and the .062 wire for over 3″ and up to 6″ in diameter. Wire bundles are available and range in length from 50ft. to 105ft. The Standard Clamptite kit includes the Clamptite, plus one roll each of the .032 and .041 wire. The Large Kit includes the Large Clamptite, plus one roll each of the .051 and .062 wire. See all the range of Clamptite Tools and Wire available to purchase from Clamptite HERE and here. 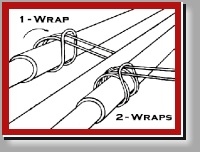 The three illustrations shown are for a more simplified single strand wrap for a fast and easy fix. This method will allow for as many wraps as desired. Lube threads before using. 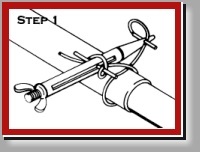 The four illustrations shown are for a double strand wrap for a very secure item. Lube threads before using.